I picked up a copy of Gary Engel's new Vintage Edition of the Japanese Baseball Card Checklist and Price Guide recently. 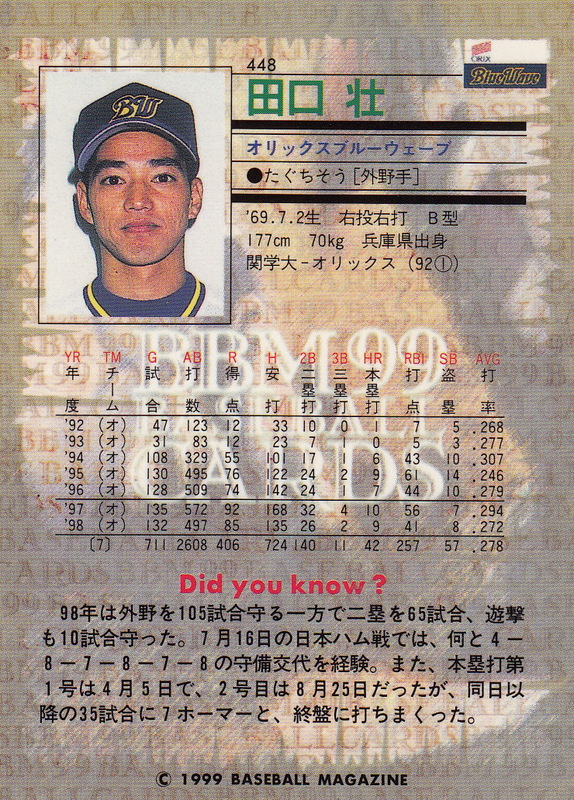 The new guide only covers the pre-BBM era (before 1991) but it covers it in a lot of detail - adding a lot of new information about menko and bromide cards and even adding new information about some of the Calbee sets from the 70's. 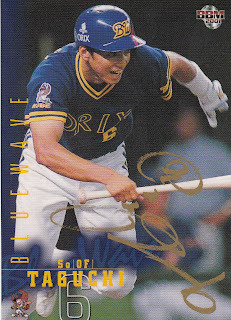 I've been going through the book trying to identify some cards that I've picked up off eBay over the years. 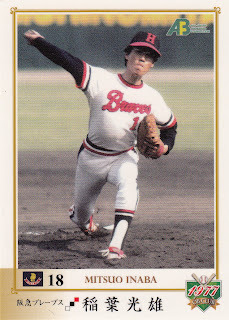 I'm having mixed success - locating some cards but not some others, although in a couple cases, even though I haven't id'd the cards, I know more about them than I did before. 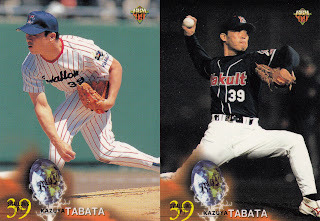 I got these two blank backed cards with a group of other bromides a while back. 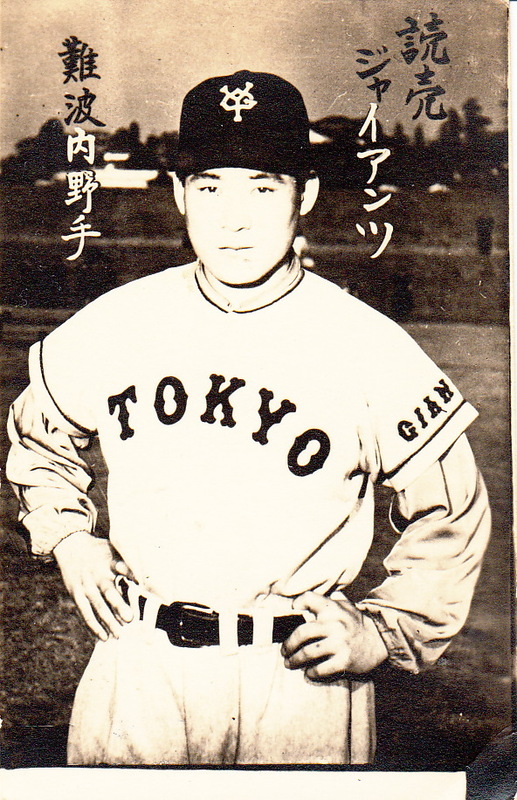 I had no idea when they were from or who the players were until while thumbing through the book I noticed that the top card was actually the sample card Engel chose for the 1958 Hinomaru Yomiuri Giants set. 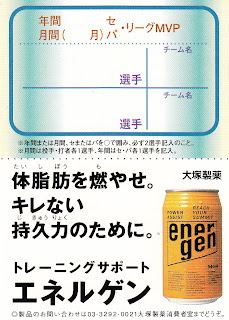 Doing a little more research combining the card descriptions in the book (there's about three to five cards in the set with a pose that's described as "hands on hips" or "hips up portrait") and the Player Number Index (where I can attempt to match the kanji on the cards to the text on the website, then have the browser translate the kanji to English), I think that the top player is Shigeru Fujio and the bottom player is Shojiro Namba (or Nanba - Japan Baseball Daily says Namba, the book says Nanba). 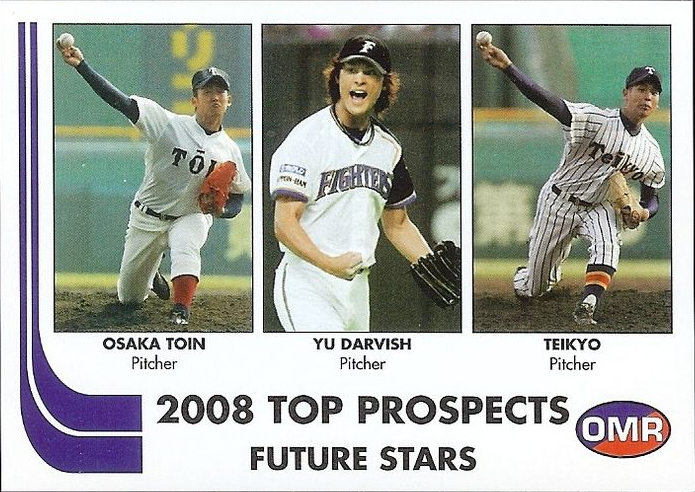 Hey, one of the other guys from that OMR "Top Prospect" card of Darvish I keep seeing on eBay won Koshien. BBM released information about a couple of new sets today. The first one is this year's edition of the annual All Star set. It's a 70 card box set featuring cards of the 64 players who appeared in the three games last month plus the six managers (three from each league) who served as the managers and coaches for the teams. 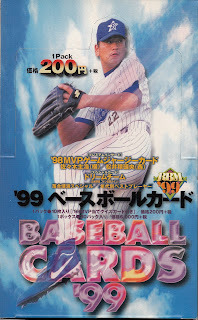 If the description on the website is to be believed, there will not be any cards for the top vote getter or the game MVPs, which have been standard fare for this set for a number of years. The set will be released at the end of August. The other set they announced is called Genesis (which is obviously in tribute to the 30th Anniversary of The Wrath Of Kahn, right?). 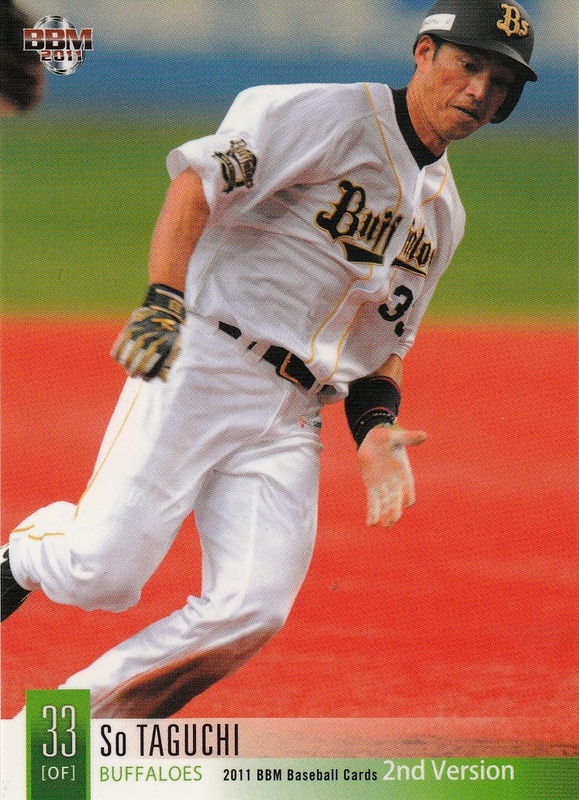 This is the new BBM high end set, which is taking the place of the annual Touch The Game set (which replaced Diamond Heroes in 2002). 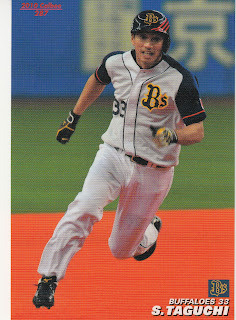 The base set has 108 regular cards (9 per team) along with the final 36 "Cross Blaze" cards (this year's cross set subset). 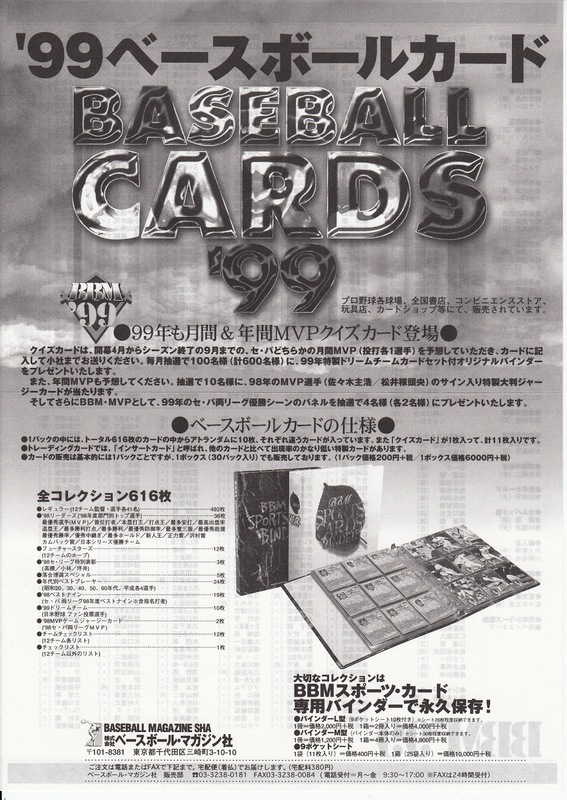 There's eight separate insert sets - "Pitch On Leather"(12), some sort of checklist/highlight set (12), "Hit On Wood" (12), "Elite Of Nine" (12), "Franchise Legend" (12), "Ultra Nova" (12), "Cross Blaze Rookie" (12) and "Team Trinity" (36). 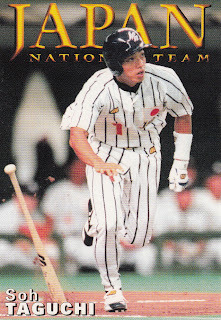 Looks like their are nine insert cards per team - I wonder if the nine players are the same nine as the base cards. The big draw of the set is the large number of premium inserts - lots of memorabilia, patch, ball and autograph cards in all sorts of combinations. The set will be out in mid-September. To celebrate the end of the century, BBM included a subset highlighting the best players of the 20th Century. 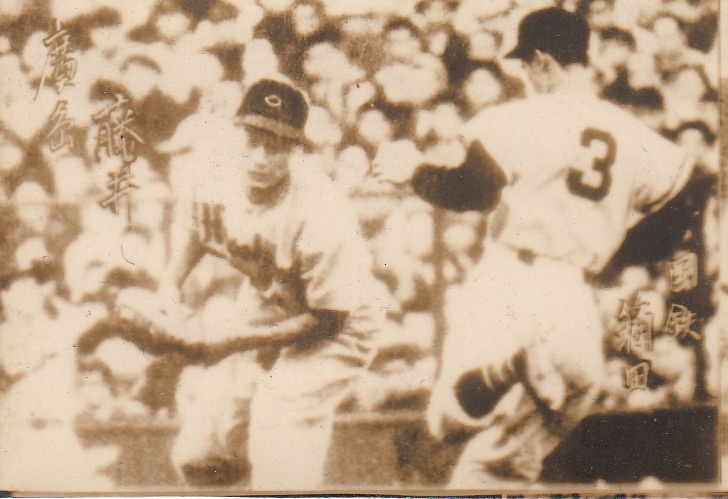 The subset had 24 card, four players from each decade from the 1940's to the 1990's. 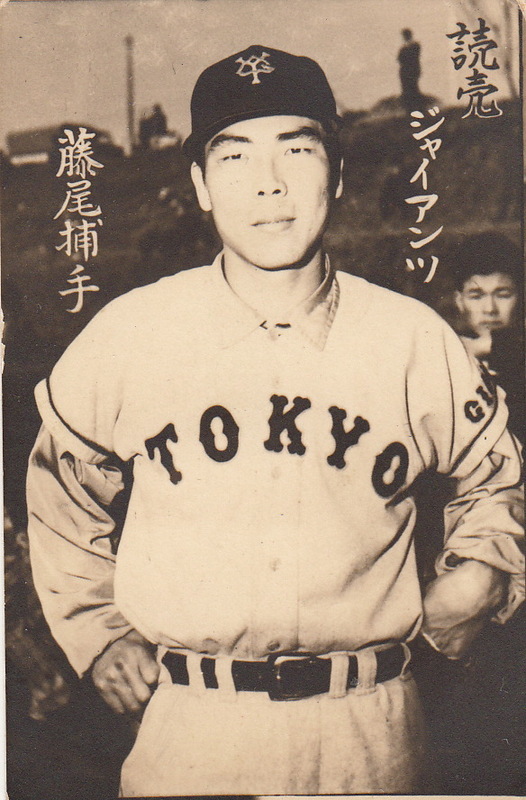 The players from the '40's were Takehiko Bessho, Tetsuhara Kawakami, Atsushi Aramaki and Hiroshi Ohshita. Masaichi Kaneda, Shigeo Nagashima, Kazuhisa Inao and Futoshi Nakanishi represent the 1950's. 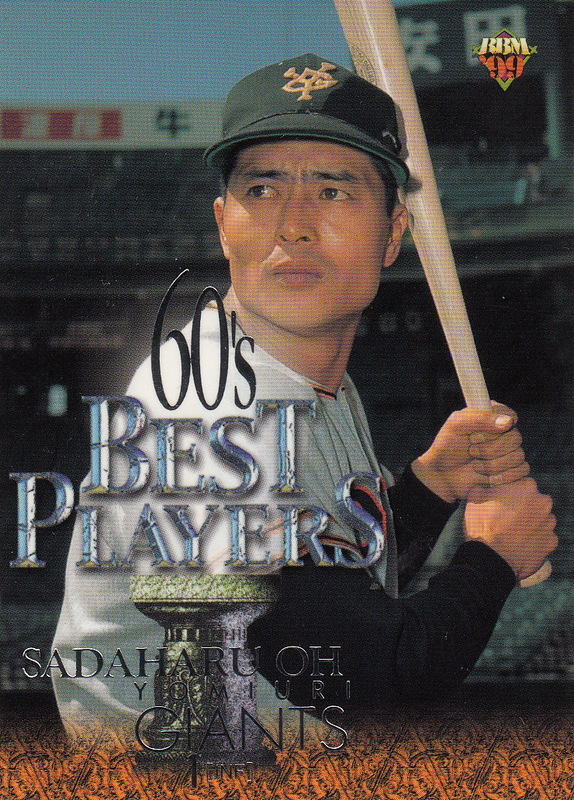 Tsuneo Horiuchi, Sadaharu Oh, Hisashi Yamada and Katsuya Nomura cover the 1960's. 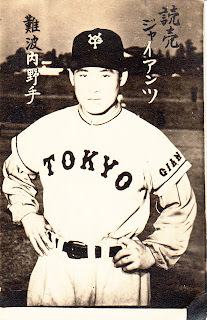 The 1970's are taken by Masaji Hiramatsu, Koji Yamamoto, Choji Murata, and Hromitsu Ochiai. Yutaka Ohno, Atsuya Furuta, Kimiyasu Kudoh and Kazuhiro Kiyohara are the 1980's players and the 1990's are repesented by Kazuhiro Sasaki, Hideki Matsui, Fumiya Nishiguchi and Ichiro. I'm not sure what measure BBM used to pick the players or why they were assigned to their particular decades. 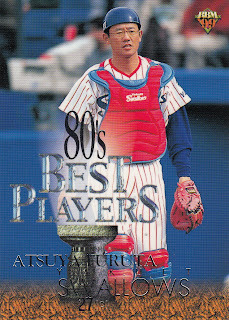 A couple really make no sense - Furuta debuted in NBP in 1990, not in the 1980's and both Ochiai and Yamada only played one season in their respective assigned decades. On the plus side, it's surprising that both Nomura and Kaneda appear in the set, given how rarely they make appearances in the OB sets. Speaking of Ochiai, he retired following the 1998 season and BBM added a five card subset in his honor. 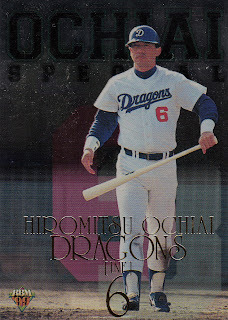 The "Ochiai Special" subset included a card for each of the four teams he played for in his 20 year career (Orions, Dragons, Giants and Fighters) plus a card showing him in a suit (the card is labelled "three times triple crown"). 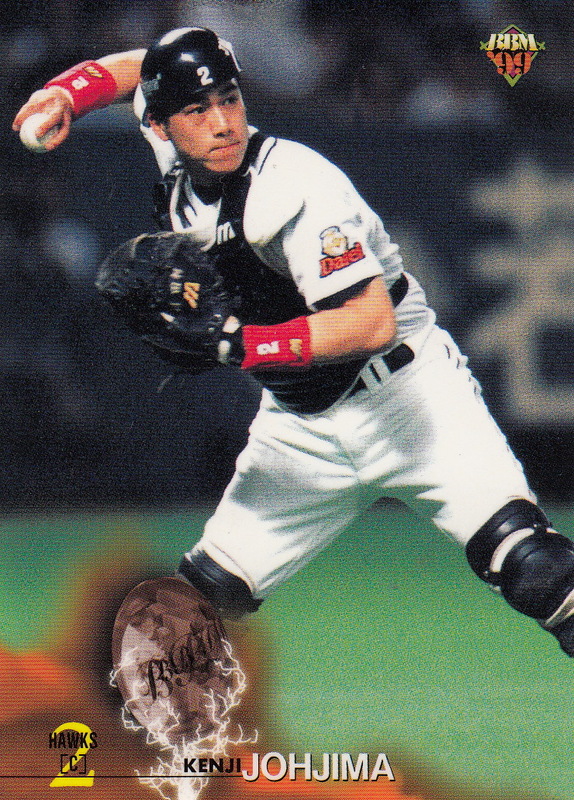 The cards all had a shiny silver finish on them. 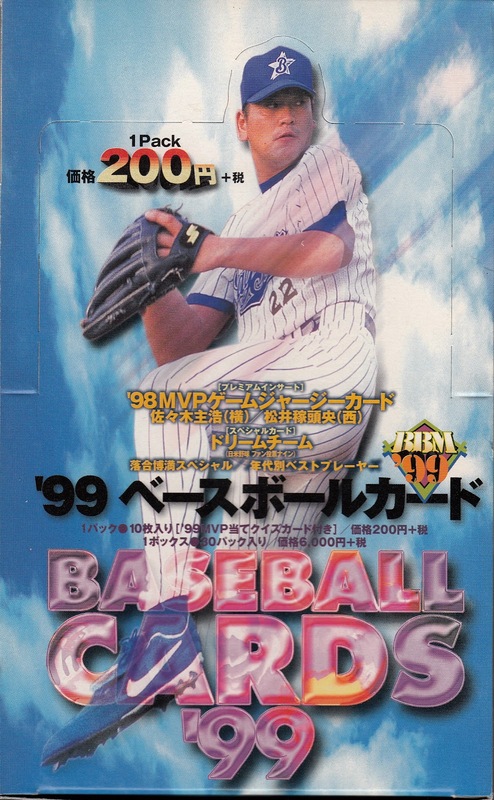 There was also an odd little subset featuring three Central League players who had apparently won some sort of "Central League Special Award" in 1998 - Tomochika Tsuboi of the Tigers, Kanei Kobayashi of the Carp and Yoshinobu Takahashi of the Giants. I have no idea what the Special Awards were and I don't think BBM has ever had this subset again. There were only two insert sets with this set. One of these was a 19 card set honoring the previous year's Best 9 winners. 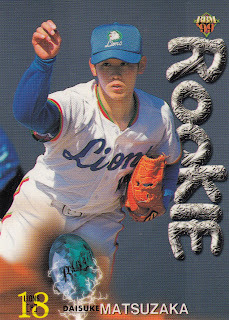 This had been an insert set in 1997 but a subset to the regular set in 1998. It will remain an insert set for the next 12 years. The other insert set was a 10 card "Dream Team" which (like the 1998 version) featured a "dream" lineup. 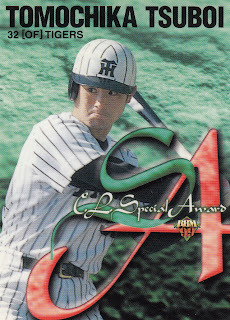 This year's edition were diecut cards - there was a special "sweepstakes" version of these available to winners of a mail in contest - Collecting Ichiro has both the regular and sweepstakes version of the Ichiro card. 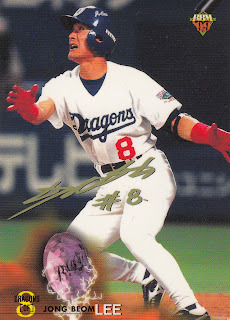 The 1999 set featured the first Late Series cards since 1996. 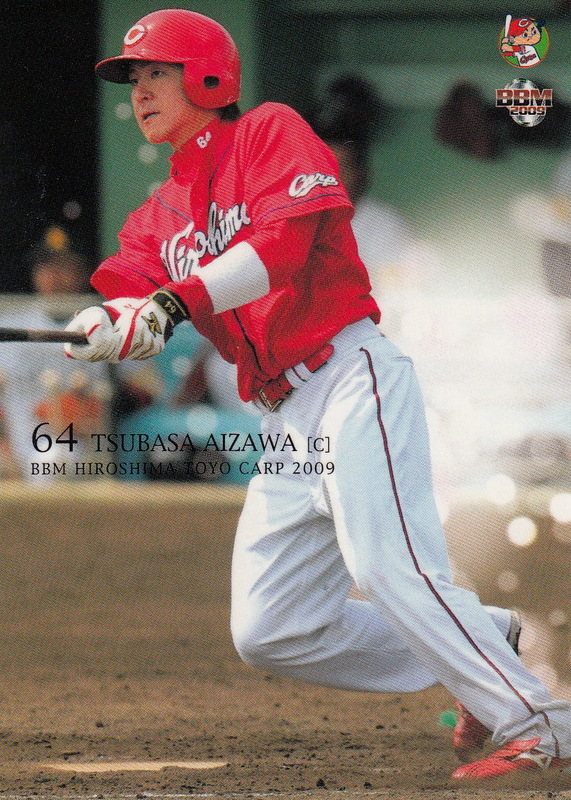 This year, the Swallows were celebrating their 50th season so they changed their uniforms and added an Anniversary patch to the sleeve. It's funny sometimes how your mind sees things that you expect to see. 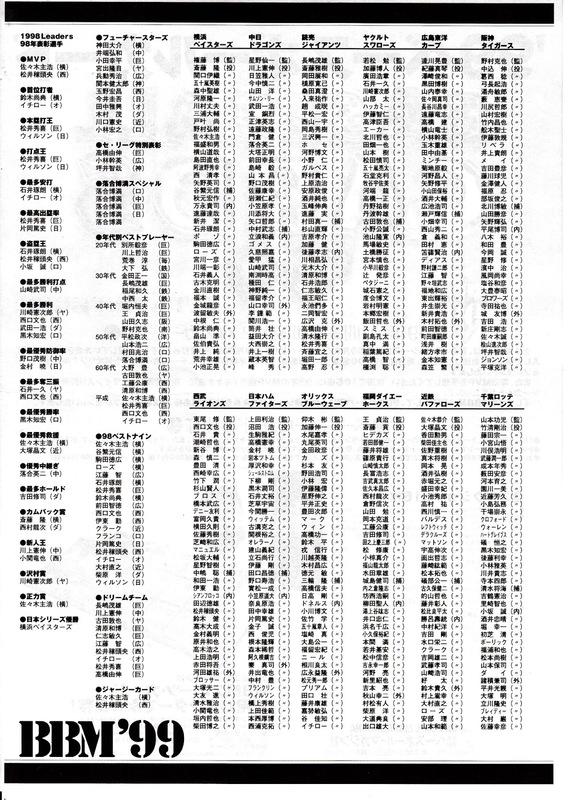 Since 2008, BBM has issued two Tokyo Big Six sets per year, one for the spring season (the Spring Version) and one for the fall season (the Autumn Version). 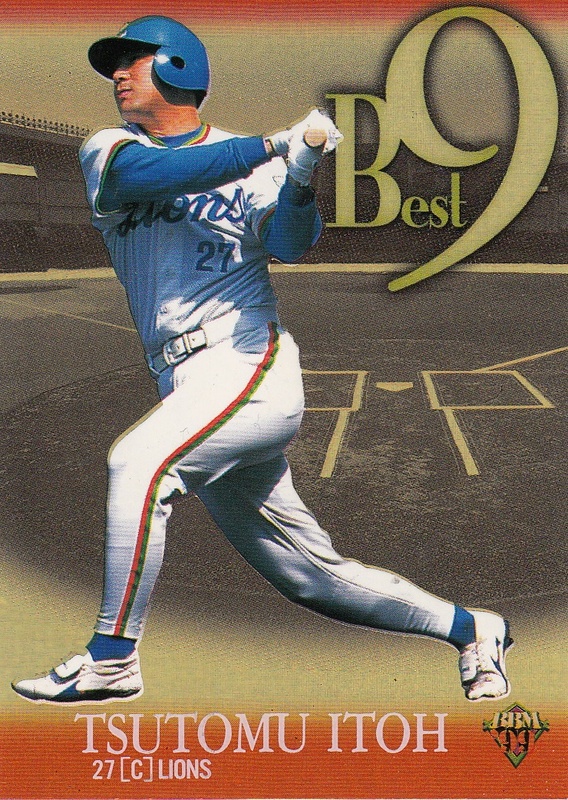 As is typical of BBM cards, each card has the set name on it. 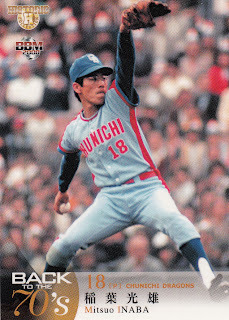 So last spring, when BBM issued a Tokyo Big Six set, I just assumed that it was the Spring Version, just like it had been the four previous years. 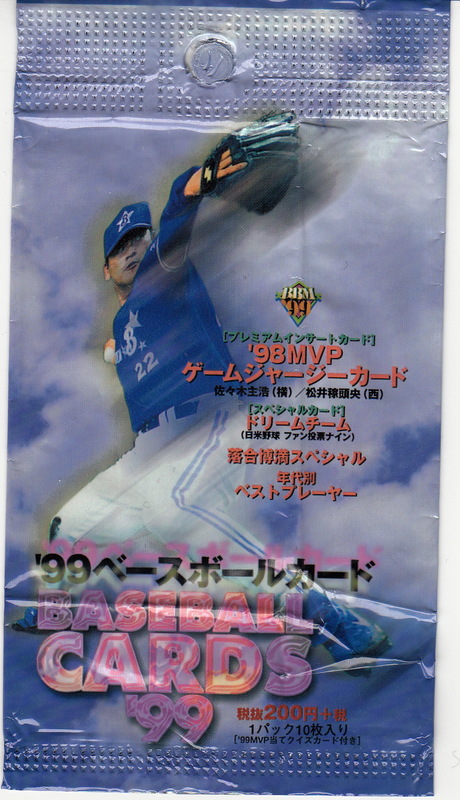 I assumed it was the Spring Version even after I had written a post about it, including scans of the box and several cards. 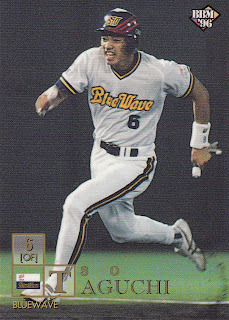 I assumed in was the Spring Version even after putting all the cards in alphabetical order by team and put them in 9 pocket sheets in my "college sets" binder. But guess what I just realized? The set is not the Spring Version. Now that I actually look at the cards without already having decided what they say, I see that the cards (and the box) are labelled "2012 BBM Tokyo Big6 Baseball League Card Set". There's no "Spring Version" to be seen anywhere. Which makes me wonder - will this be the only Tokyo Big Six card set BBM does this year? 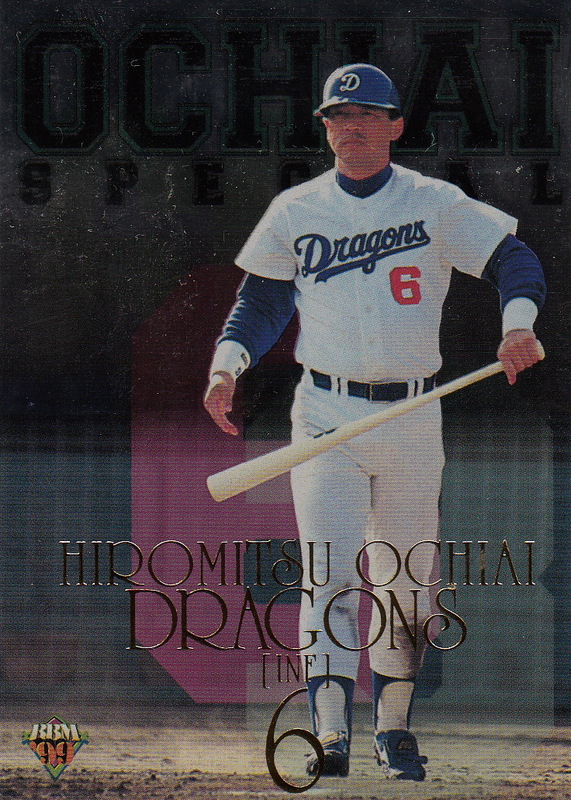 Mitsuo Inaba, the Dragons minor league pitching coach, passed away suddenly over the weekend. 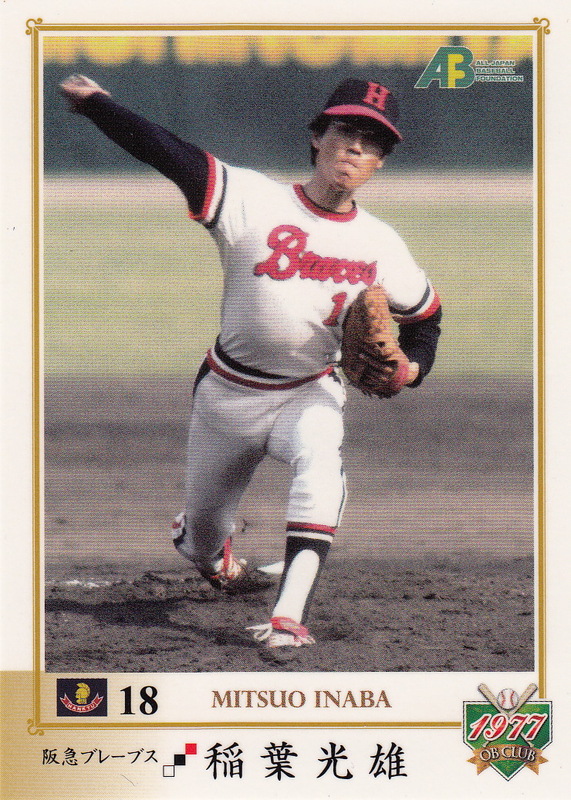 Inaba pitched for the Dragons (1971-76) and Braves (1977-83) and had coached for both the Dragons and Fighters. 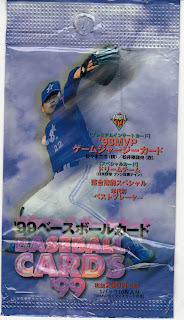 This week, Calbee announced their third (and I assume final) series for 2012. Like Series Two, there will be 72 "regular" player cards in the set (six per team), numbered 146 to 217 to follow the first two series. 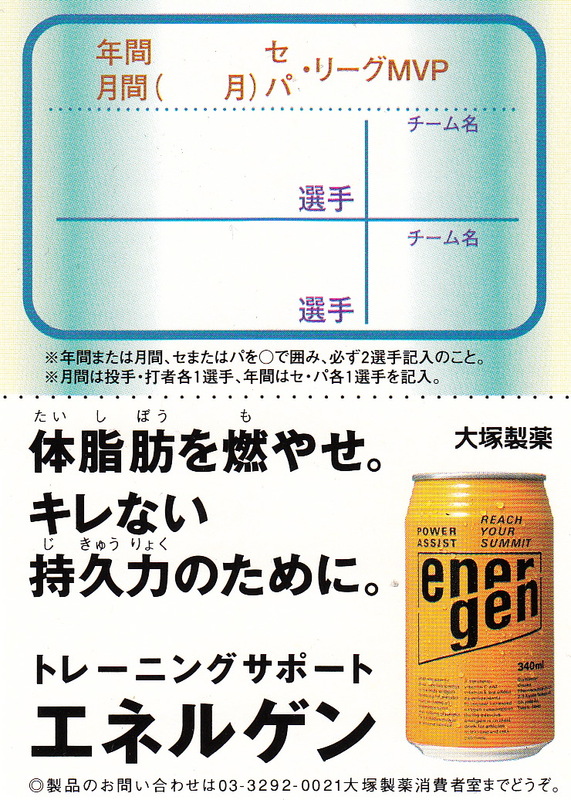 There will be three subsets - two of which continue subsets that have been present in the first two series. 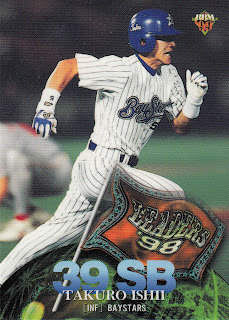 The All Star (AS) subset features 22 cards for the players who were elected by the fans to the All Star rosters (except Terrmel Sledge). 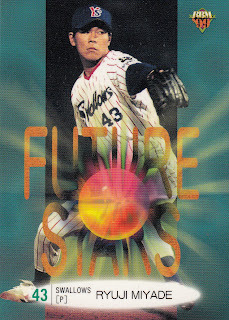 Calbee continues it's celebration of its 40th Anniversary by continuing the Memorial (M) subset - this time there are 12 cards showing reprints of earlier cards for active players (1 from each team). 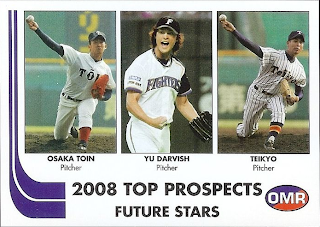 The remaining subset is the four checklist cards (C) showing various highlights from the season, including Senichi Hoshino's 1000 managerial win and Kenta Maeda's no-hitter. 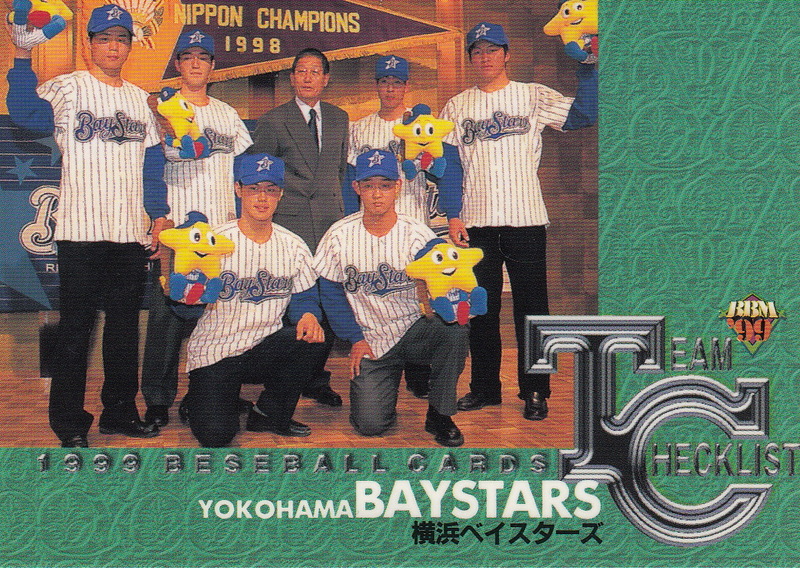 There's also a 24 card Star (S) insert set featuring two players from each team. This insert set continues the set started in the first two series - so there's a total of 72 Star cards in all (six per team). 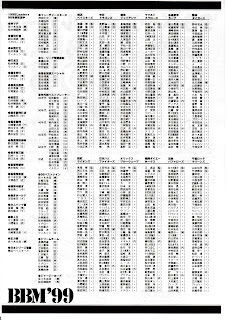 As usual, the checklist is available on line. This is an odd little bromide card I picked up on eBay a few months ago. I'm not sure when it's from, although the Carp uniform shown looks like the one used between 1954 and 1956. I've been attempting to figure out who is on the card. 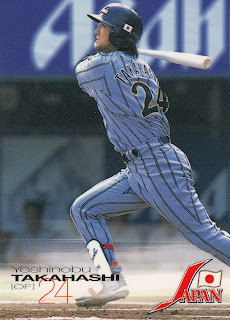 I think the regular first baseman for the Carp during those years was Makoto Kozuru but the kanji doesn't look right for him. 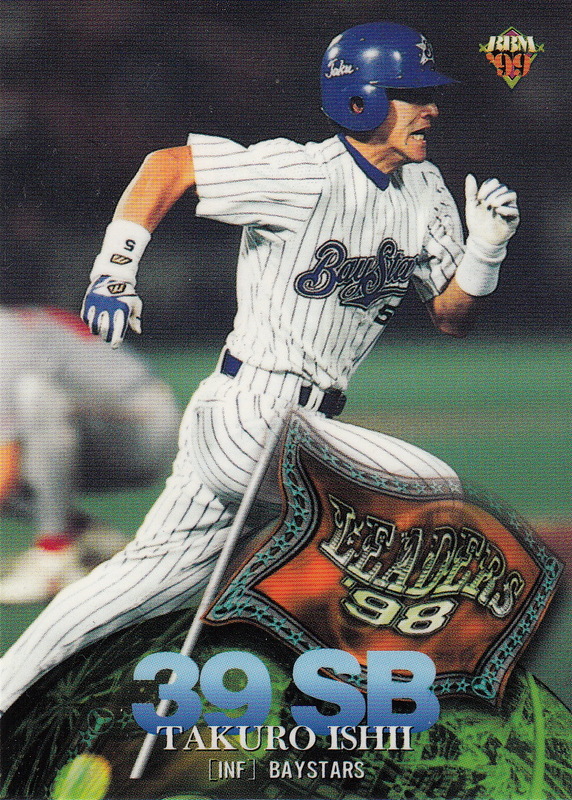 I think the baserunner is Jun Hakota of the Kokutetsu Swallows - he wore uniform number 3, the uniform looks like the Swallows uniform from 1955-1959 (with the stripe on the sleeve) and the kanji looks like it might fit - the second character is pretty clearly "ta". 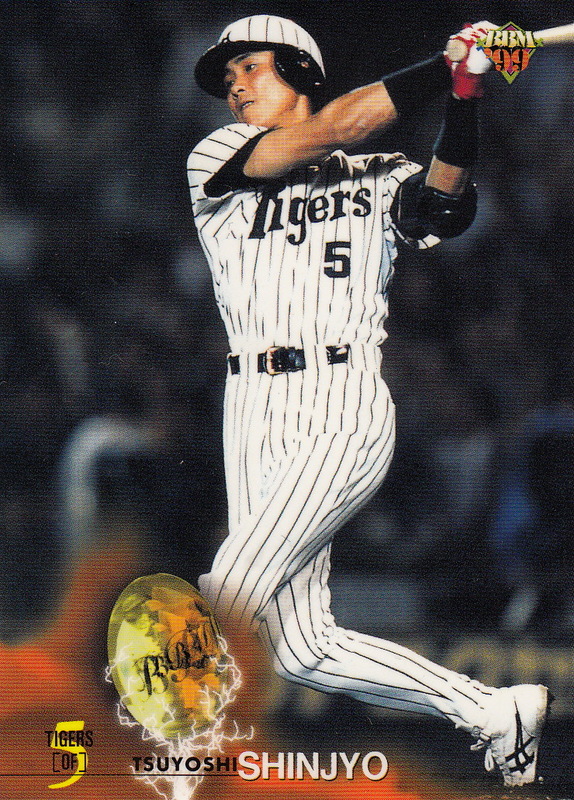 So Taguchi announced his retirement last week. 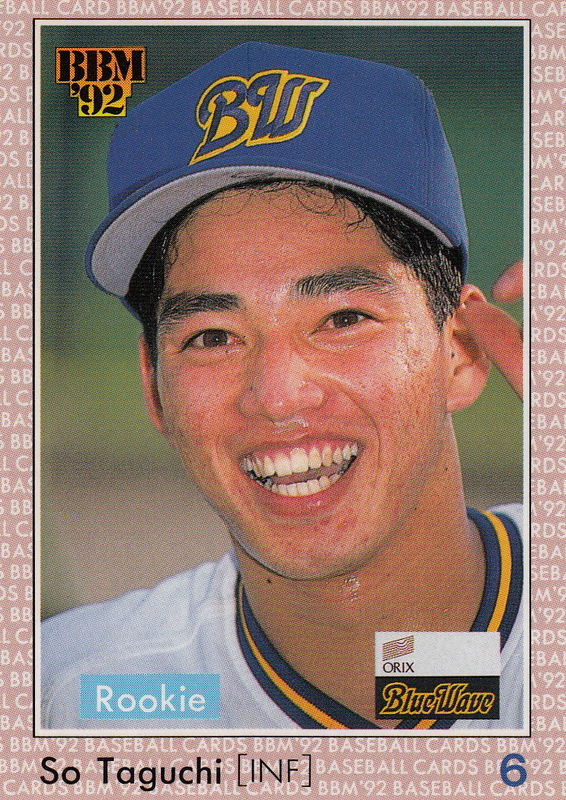 He had been unable to find a team willing to pick him up after Orix let him go following last season, so he decided it was time to hang it up. Taguchi was the first round draft pick of the then Orix Blue Wave in the 1992 draft (which was held in the fall of 1991). His BBM and Takara rookie cards were from the 1992 sets (#448 for BBM). 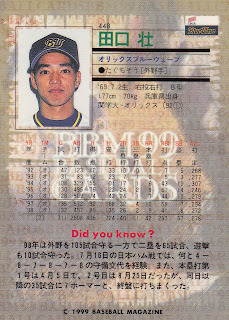 His first Calbee card was not until 1995 (#152). 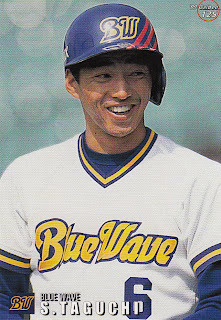 Taguchi remained with the Blue Wave for 10 seasons. 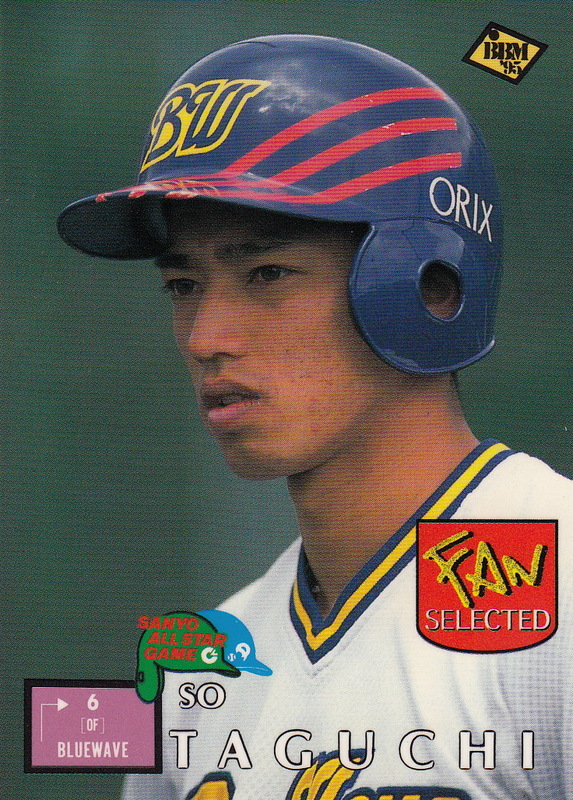 He followed his fellow Orix outfielder Ichiro to the US following the 2001 season. 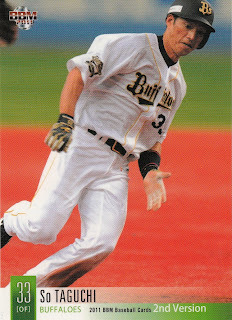 Following nine years in the US with the Cardinals, Phillies and Cubs, Taguchi returned to Japan and Orix for the 2010 and 2011 seasons. 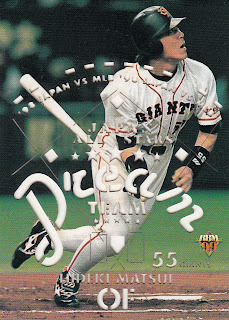 He made four All Star teams (1995-97 & 2001) and played in two Nippon Series (95 and 96), winning it all over the Giants in 1996. He also was one of the eight NPB players to appear on the 2000 Japanese Olympic Baseball Team, which was commemorated by a subset in the 2001 Calbee set. 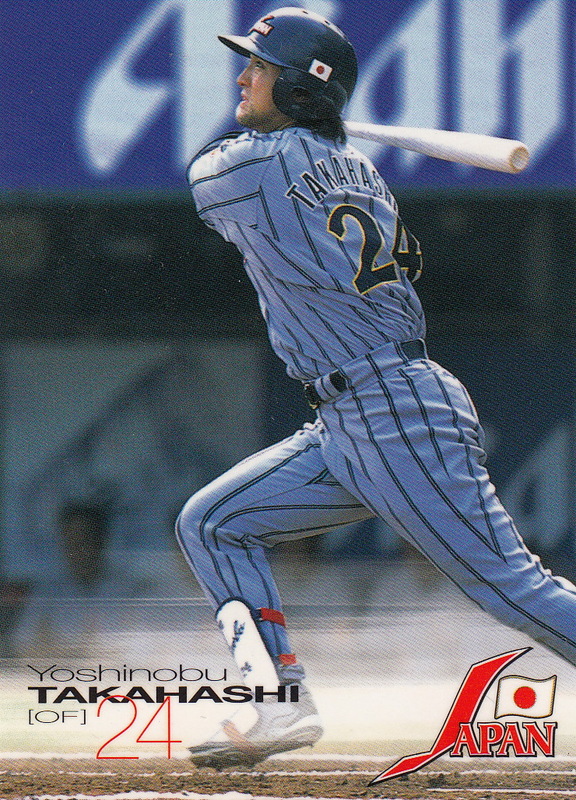 Taguchi was never a great player but for some reason I always liked him. He'll be someone I miss now that he's retired. Scary moment during the Carp-Baystars game on Thursday - Tsubasa Aikawa of the Carp was hit in the face by a 148 kph (~92 mph) fastball thrown by Yokahama pitcher Shun Yamaguchi. 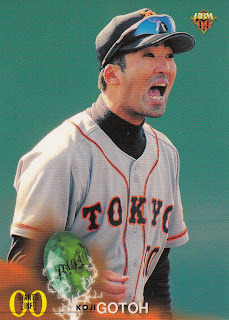 It looks like Aikawa has only suffered a broken nose - although he was carted off the field via ambulance just to make sure. Hopefully he will recover soon.